Organic farms supply nitrogen (N) inputs to plants in many different forms: manure, compost, cover crops, and soluble fertilizers. Most of the N in these inputs is organic N, and microbial transformations convert it to mineral form for plant uptake. In other words, soil microbes mediate the process of N mineralization. In fact, N mineralization of organic N is only one of many fascinating microbial processes involved in soil nutrient cycling. The goal of this short review is to provide explanations for some of these processes, so that organic farmers can better manage N in their soils. See Jackson et al. (2008) for a more detailed analysis. The soil N cycle is driven by soil organic matter (SOM), which contains approximately 50% carbon (C) and 5% N. Only 1 to 5% of the N in SOM is in a labile form, that is, it is present as microbes and/or can be readily used by microorganisms. Microbes break down the long polymers (complex chains of compounds) in SOM by secreting extracellular enzymes, or by absorbing and transforming these compounds into smaller forms that are later released. These smaller compounds called monomers, such as amino acids, are recycled and reused by a huge range of microbial populations. Predation of microbes by the soil fauna also releases labile nitrogen. Microbial damage and death, caused by stress, such as wet-dry or freeze-thaw cycles, also contribute to recycling of organic and mineral N. In addition, plants exude compounds out of the roots into the soil (root exudation) that help to break down organic matter, as do mycorrhizal fungi that are symbiotic on roots, and which extend hyphae into the surrounding soil matrix. Through mineralization, microbes break down organic monomers and release N as ammonium (NH4+). Plants take up NH4+, and NH4+ has been shown to be an important source of N for plants on organic farms. But microbes compete very well with plant roots for NH4+: they are tiny, ubiquitous, and often congregate on organic matter. Nitrification (or ammonia oxidation) is one process by which microbes utilize NH4+; NH4+ is used as an energy source by ammonia-oxidizing microbes to produce nitrite (NO2-) that is usually quickly converted to nitrate (NO3-) by the process of nitrification. As with NH4+, both plants and microbes take up NO3-, to meet their N demand through the process of N immobilization. Figure 1: (A) Roots of canola growing into a soil pore, in close contact with each other and dead roots of wheat (black arrows). Root hairs (white arrow) extend from the canola roots to bind to soil, and other living and dead remnant roots. This shows the close proximity of microbes and roots on decaying organic matter. Bar = 3 mm. 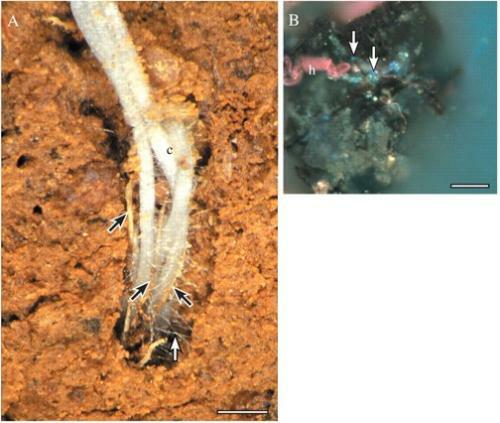 (B) Root hair of wheat associated with some dark soil organic matter, bacteria (bright blue spots; some indicated by arrows) and soil particles, again illustrating the interaction between roots, organic matter and microbes. Bar = 20 mm. Bar = 10 mm. Figure and caption credit: Watt et al., 2006. What makes for highly efficient N cycling? When active microbial populations are rapidly mineralizing N from labile SOM, and at the same time, plant roots are taking up NH4+ and NO3- at rapid rates, then there can be very effective and efficient transfer of soil N to plants, with little potential for N loss. Figure 2. The soil nitrogen cycle. Mineralization refers to the microbial breakdown of organic N to form NH4+. Nitrification is the microbial oxidization of NH4+ to form NO3-. Denitrification is the reduction of NO3- under moist conditions to form N2O and N2 gas. Figure credit: Jackson et al., 2008, adapted from Schimel and Bennett, 2004. Reprinted, with permission, from the Annual Review of Plant Biology, Volume 59 ©2008 by Annual Reviews http://www.annualreviews.org. Soils contain an astounding diversity of microbes. Most of the microbes in soil, however, have not been identified. There are methods that allow rough approximation of bacteria and fungi in soil, and show that fungi tend to be higher in undisturbed soils (e.g. no tillage or with accumulation of surface leaf litter). In general, high bacteria:fungi ratios are indicative of more rapid rates of N mineralization. Figure 3. Illustration of 1 cm2 of soil (Elliott and Coleman, 1988). Idealized view of a highly structured community of a grassland soil. Click to view a higher resolution image. Reproduced with permission of Blackwell Publishing Ltd. Some specific functional groups of soil microbes have been studied in detail (e.g. biological N fixation and arbuscular mycorrhizal symbiosis). Rhizosphere research has shown that a great deal of activity and diversity is present in the immediate vicinity of the root, and future research may show that organic farming practices may be able to foster rhizosphere processes that retain soil N.
Biological N fixation is the conversion of N2 to NH4+, and it occurs both by free-living and root-symbiotic prokaryotes. 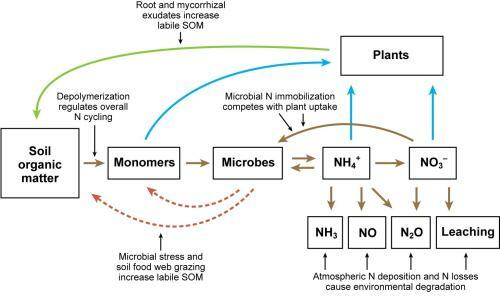 The Rhizobium/legume symbiosis is most active under N-limiting soil conditions, because N uptake from the soil is less costly to the plant than supporting the microbial symbiosis in the roots to reduce atmospheric N2. Plant dependence upon this symbiosis decreases when soil N availability increases. Legume cover crops thus will fix more N when grown in a soil with low NH4+ and NO3-. For example, if legumes are planted after excessive N inputs to a vegetable crop, rates of N fixation will be low. Under both high and low temperatures, N2 fixation increasingly declines. Legumes have high requirements for P, and P acquisition is enhanced by arbuscular mycorrhizae (AM), dense cluster roots, and organic acid secretion to increase the availability and extraction of inorganic P, which in turn, increases N-fixation capacity. Arbuscular mycorrhizae (AM) fungi live within the roots of many crop plants (i.e. endosymbionts), and can be important for N uptake in organically-farmed soils. The use of fungicides in conventional soil is detrimental to this symbiosis. Under high nutrient conditions, the support of the fungal symbiont is an excessive cost to the plant, because the plant roots are able to satisfy the plant's nutrient requirements. AM colonization generally declines in response to N fertilizations. Excessive N can occur in organic systems after over-addition of manure, soluble N fertilizer, or N-rich cover crops (see Concepts for Organic Fertility). Compared to conventional agriculture, N inputs are more expensive and more difficult to apply in organic agriculture, and this makes over-addition less likely, but there are still seasons (e.g. after spring inputs or after harvest) in which N losses can be problematic for the following reasons. Losses of N occur as a result of organic matter mineralization and release of NH4 and then NO3 that can be leached to groundwater or leave in surface runoff. This mineralization may not coincide wih crop uptake in some environments. For example, there can be considerable mineralization in the fall when soils are still warm and leaching rains occur. Microbial reservoirs can immobilize nitrogen if there is sufficient high quality organic matter present in the system. Organic farms, like all ecosystems, are susceptible to gaseous losses of N as nitric oxide (NO), nitrous oxide (N2O), and nitrogen gas (N2) through microbial N transformations. The first two compounds are environmentally undesirable, but N2 gas is inert, and loss of N2 is simply wasteful of the N that could otherwise have been available to crops. In general, it is best to avoid high soil N concentrations and anaerobic conditions, in order to avoid gaseous N losses. Nitric oxide is an air pollutant; it reacts with volatile organic compounds to form ozone (O3) in the troposphere, and it is also a precursor for nitric acid deposition via atmospheric transport. Nitrous oxide is a potent greenhouse gas that contributes to stratospheric O3 destruction. Both are to be avoided! One of the best ways to achieve low gaseous losses is to make sure that NH4+ and NO3- are in low concentrations in the soil, and that continuous plant cover is present and thereby maintains active N uptake. The main cause of N2O emissions is denitrification under wet or anaerobic conditions in the soil. Denitrification takes place when heterotrophic bacteria under oxygen limitation use NO3- as alternative electron acceptor to produce N2O and N2. The N2:N2O ratio increases with decreasing O2 availability, and it often decreases under high NO3- availability. Nitrification (see above) is also conducive to generally small gaseous losses of both NO and N2O. Other losses of N also occur. The emission of ammonia (NH3) gas increases at soil pH>8, and ultimately contributes to N deposition elsewhere in the landscape. Leaching of NO3-, which contaminates groundwater, occurs at high water contents, especially in coarse-textured soils and shallow soils over fractured bedrock substrata. Runoff carries N in various forms to surface waters. Leaching and runoff losses can be minimized by always having plants present (e.g. cover crops during the off-season) to take up N, to decrease soil moisture by evapotranspiration, and to restrict the movement of surface and drainage water. Crops mainly take up NH4+ and NO3-, rather than amino acids or other monomers. The exception is in extremely N-poor and cold ecosystems. Thus, mineralization and nitrification are very important for the N supply to plants, especially in situations when these mineral forms of N are not supplied as fertilizer. What conditions decrease the capacity for nitrification and mineralization? Nitrification is inhibited at very low moisture; activity increases with soil moisture, but does decline as the soil becomes saturated. It is also more prevalent in tilled soils than undisturbed soils. Mineralization is less sensitive to environmental conditions, however, probably because so many different organisms in the soil food web are involved. Soil N availability to plants is closely tied to the labile, readily available soil C in the SOM. For example, plant litter with a high C:N ratio (such as straw) initially increases microbial N immobilization, and decreases NH4+ and NO3- availability to plants, but N available increases as microbial processing of the labile C proceeds with time. Thus, planting crops after a cover crop that has reached maturity should be delayed to give time for microbial breakdown of the residue, and thereafter, gradual release of mineral N.
The true availability of NH4+ and NO3- is difficult to measure in soil. When rates of microbial N transformations and/or plant uptake are very rapid, then NH4+ and NO3- can be undetectable in soil. These pools turn over typically one or more times per day during the growing season. This is very useful for organic farming, as mineral N is continually being supplied to plants by microbial processes, but it is not easy to measure. Organic farmers need a better set of measurement tools to detect N deficiencies and to monitor soil N. The reliance on soil processes in organic farming is so different from the conventional approach of periodic additions of fertilizer N. This is an area of much-needed research, and will require the use of new types of soil bioassays, the use of specific types of indicator plants that can be used as “forecasters” of impending N deficiency, and in the future, molecular assays of microbial populations as indicators of high activity of mineralization, nitrification, or gaseous losses. With novel monitoring approaches, organic farming will become even more efficient in terms of its use of N, and for successful use of renewable resources for both productivity and environmental quality. Booth, M. S. , J. M. Stark, and E. Rastetter. 2005. Controls on nitrogen cycling in terrestrial ecosystems: A synthetic analysis of literature data. Ecological Monographs 75: 139–57. Burger, M., J. E. Jackson. 2003. Microbial immobilization of ammonium and nitrate in relation to ammonification and nitrification rates in organic and conventional cropping systems. Soil Biology and Biochemistry 35: 29–36. Burger, M., J. E. Jackson, E. J. Lundquist, D. T. Louie, R. L. Miller, D. E. Rolston, and K. M. Scow. 2005. Microbial responses and nitrous oxide emissions during wetting and drying of organically and conventionally managed soil under tomatoes. Biology and Fertility of Soils 42: 109–18. Cavagnaro, T. R., L. E. Jackson, J. Six, H. Ferris, S. Goyal, D. Asami, and K. M. Scow. 2006. Arbuscular mycorrhizas, microbial communities, nutrient availability, and soil aggregates in organic tomato production. Plant and Soil 282: 209–25. Drinkwater, L. E., and S. S. Snapp. 2007. Nutrients in agroecosystems: Rethinking the management paradigm. Advances in Agronomy 92: 163–86. Elliott, E. T., and D. C. Coleman. 1988. Let the soil work for us. In H. Eijsackers and A. Quispel (ed.) Ecological Implications of Contemporary Agriculture. Ecological Bulletins 39: 23–32. Jackson, L. E., M. Burger, and T. R. Cavagnaro. 2008. Roots, nitrogen transformations, and ecosystem services. Annual Review of Plant Biology 59: 341–363. Schimel, J. P., and J. Bennett. 2004. Nitrogen mineralization: Challenges of a changing paradigm. Ecology 85: 591–602. Watt, M., W. K. Silk, and J. B. Passioura. 2006. Rates of root and organism growth, soil conditions, and temporal and spatial development of the rhizosphere. 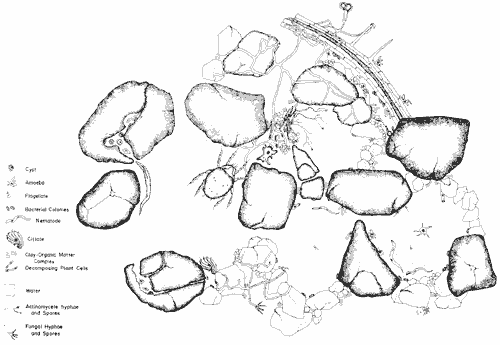 Annals of Botany 97: 839–855.